In The Hands of God, originally uploaded by navandale. During this spectacular sunset from Hopi point on the South Rim of the Grand Canyon, a child nearby exclaimed, "Look, God's talking!" I couldn't help but to smile and agree. The Grand Canyon was the final destination on a journey that I will always remember as being the most magical and meaningful of sojourns. Starting in South Lake Tahoe, where I'd lived over the winter as an on-mountain photographer at Sierra at Tahoe, I traveled first to the Redwood National Park in Northern California, Through Lassen and Whiskeytown National Parks, to Yosemite for a few days, and then on to Death Valley for a night of salt-flat photography. After a quick visit with friends in Vegas, I went on to Zion National Park, Bryce Canyon National Park, and Monument Valley on the Navajo Reservation. 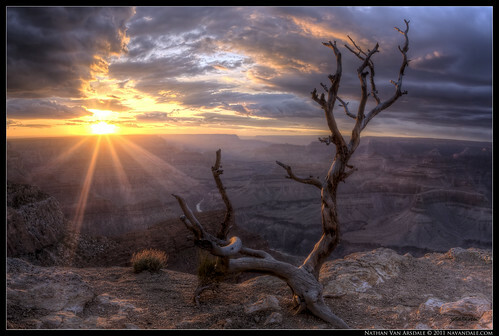 Then Finally, I arrived at the Grand Canyon, and to one of the most beautiful sunsets I've ever seen. Aside from the intrinsic awesomeness of all of those places, each and every day became more perfect as far as the experiences that I needed. I am an independently spiritual person, and I value the teachings of almost all of the religions and philosophies that I have studied. I make this distinction because the use of the word God means many things to many different people. What I feel, believe, and perceive is a universally connected guiding and organizing force that is never separate from anything, and is always resonating in ways that we can consciously interact with. For many people, including myself, distractions, or "noise" ends up becoming the focal point of our daily lives. Money, relationships, TV, Phones, Internet, Work, Bosses, Kids, Pets, etc., etc., etc.... all gets so loud and distracting that we lose ourselves in it. We interact with people who are distracted by all of their noise, and we all feel trapped for some reason, but hardly realize it because we're so distracted. I love OUR National Parks and State Parks because we have consciously set aside places free of the noise and distractions; places where we can go to more easily tune in to that ever-present resonance. I can't count the number of times, while walking through a national park, I have to stop look up at the sky with a sigh of wonder. Sometimes our lives can feel really heavy, problems almost too big to handle. It's during those times the healing power of meekness amidst the vastness of nature makes whatever problems seem not so big. Yes, Look! God's talking! This was a Very windy sunset. We arrived about 45 minutes before this point in time, and already the sky was gorgeous, shooting sunbeams through the clouds, lighting up sections of the canyon wall. It was so windy, though, that I wanted a foreground object that would be stationary... a cool rock or a dead juniper tree, or something. I was really excited, my last trip to the Grand Canyon didn't yield a very impressive sky, and honestly, I hadn't quite honed my photabilities yet. Every day of my trip had been more wondrous than the previous, and I was already feeling the magic. I walked along the rim until, voila, before my eyes was an outstretched dead juniper tree with thick enough branches that it didn't move in the strong wind. Not only that, but it perfectly framed the two visible sections of the Colorado River, and seemed to point to the sun like outstretched fingers. So, I set up my Manfrotto 055CXPRO3 tripod close to the ground with the legs extended at 45º angles for a sturdier base. That's one of the cool features of my tripod. Unlike my old aluminum tripod which connected all of the legs via cross beams, severely limiting compositional options, my new tripod has independent legs that can each fold further than 90º, and the Q90 center column folds horizontally, allowing for super close-to-the-ground shots. You can check it out here . I decided to use my shutter-release cable for this one, rather than my 2-second delay method. The light levels stayed pretty much the same until the sun went behind the San Francisco Mountains, so I didn't need to fiddle with my settings much during this time. Camera set to AEB(-2,0,+2) at ISO 100 f20, I back focused on the base of the tree, then turned my AF off, so as to not accidentally focus on something else after composing the frame. Once I had the image composed, all I had to do was fire whenever I thought the sky/canyon/tree relationship looked cool. I must have taken 30 groups of shots (that's 90 exposures) by the time the sun dipped below that last thin cloud, still partially covered, but illuminating the entire rim with a warm orange light. The tree and bush both glowed in reply to the burning clouds in the sky. Sections of the canyon in the distance were being bathed in sheets of light, which I knew would be complimented by the refraction patterns of shooting at a narrow aperture. The relationship of the clouds with the tree and the canyon were all in perfect harmony. When I saw the three images on the back of my camera, I was ecstatic! I couldn't wait to process this image and share it with the world. Prints available at my printshop.